It is way too early for a Mother's Day post, isn't it? Well, I don't care, because it wasn't Mother's Day that got me thinking about this anyway. What was it, then? It was photos of my mom's flowers. I was speaking with her on the phone a few days ago; my parents and I usually speak every few days. We live in different cities, although in the same state. She mentioned to me that her hibiscus plants were blooming. She was quite proud of them. She said that my sister had taken some pictures of them with a digital camera, so I asked if I could get some of the photos by email. Of course my mom, not being computer-savvy, wouldn't be sending any pictures by email; that would be my sister, or perhaps my brother-in-law. 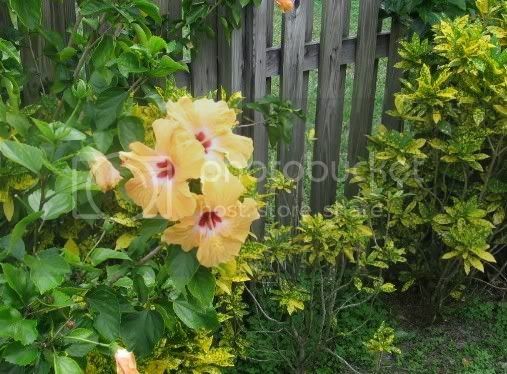 In any event, they came, and the hibiscus flowers were, in fact, gorgeous, which did not surprise me one bit, because my mother has always been good at making things grow. Now, I told you all that in order to use it as a metaphor for my parents' extraordinary ability to make their children, and grandchildren, grow. In a world filled with horrific stories about parental neglect and abuse, I guess I and my brother and sister are among those immeasurably fortunate enough to have two devoted, selfless, nurturing, and encouraging parents to call Mom and Dad. It is a blessed thing to be able to take for granted that your parents love you, and it is that kind of love that makes things grow, that made me grow, and continues to make me grow even today at 47, with 4 kids of my own. Mom and Dad, I love you with all my heart. And save a mango for me, would you? What a beautiful post. Your parents should be proud to have raised great kids who aren't afraid to say they appreciate their parents.